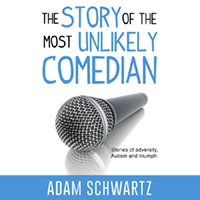 Come be inspired by the unlikely story of Adam Schwartz, an individual on the Autism spectrum with a speech impediment, who despite all odds became a stand-up comedian. This story is motivating, inspirational, funny and true. This is a brand new work from the creator of the Aspergers: A Misfit series. Adam Schwartz is a really funny comedian. Normally I start reviews with a synopsis but I feel in this case that would sell Adam short for some people. Adam has razor sharp comedic timing. He knows how to handle hecklers like a pro. He takes all of his flaws and turns them into slightly self deprecating but endearing jokes. He has an impressive background with a masters degree and it shows. Adam is a great comedian. Adam also just happens to have autism. This hour long play follows Adam’s journey as a new stand up comic and what it’s like to be in show business when your a little bit different. I laughed and cried. With this ground breaking awareness show, Adam is redefining who theatre is for. He makes it more and more accessible with every show he does. It was true that he stumbled a few times and yes he is hard to understand sometimes but that doesn’t take away from the fact that he is wickedly funny. I really liked this show and learned a lot. Definitely a must see.